The Playgro family has always been inspired by watching our own children play and grow. It’s amazing how quickly our little angels grow into toddlers, then pre-schoolers….and all of a sudden teenagers and young adults. Some of our Playgro mums and dads look back on those precious first few months with their first born and offer some very helpful advice. What do you wish someone had told you before you had your first born? Jade: To follow your motherly instincts. So many of them give their ‘general’ opinion and each baby is different. Louise: I think I had no comprehension of just how all-consuming having a newborn would be to start with. I remember being so exhausted the day I brought my daughter home – and then realizing it was going to be 24/7 for the next 20 years or so! I wish someone had told me to just relax and enjoy those precious first weeks. They zipped by so quickly. Adele: The perfect parent is a myth. Simply be kind to yourself, trust your instincts and embrace the journey, it really is fleeting. Isla: Sleep as much as you can before the baby arrives because it will be 5 years before you get a proper sleep! Dan: I wish someone had told me to get involved from day one! It took me a while to find my purpose as a dad in those first few weeks when it’s all about feeding, feeding, feeding. My wife and I became quite a team once we worked it all out. I took over burping and bathing and we shared as much as we could. What adjustments did you make for baby? Jade: Routine! My routines had to totally change! 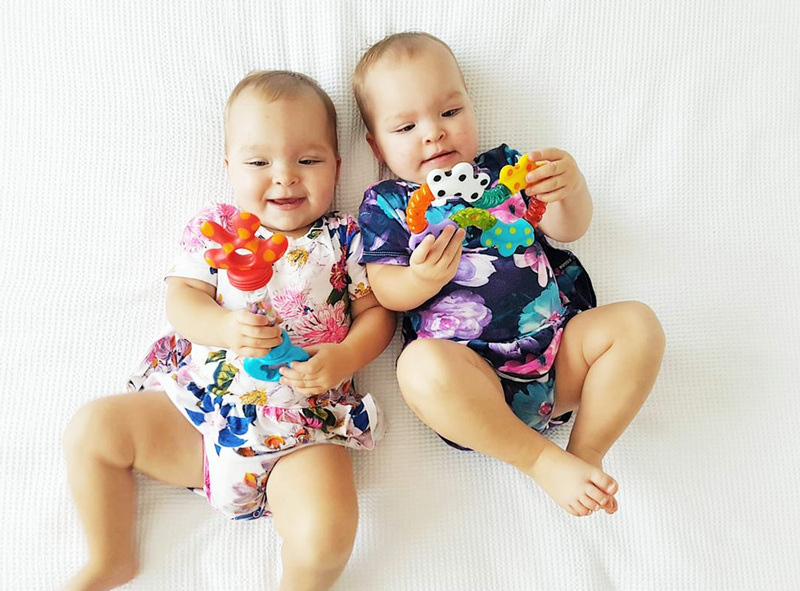 I wanted my babies to have a solid routine themselves and I wasn’t prepared to make them ‘fit’ into the same lifestyle I had before. If my baby needed to sleep, we would be home and they would be in their cot! Louise: 100% of everything was turned upside down – eating, sleeping, socializing, cleaning, even showering! I was amazed at how long it took to prepare and bath a baby! We bought lots of stuff we didn’t need – so I tell people now to wait until they need something before they rush out and buy it. Adele: Everything! Routines and expectations changed enormously and every room in the house bore evidence that a new little person was now in residence. Isla: Everything about your current life changes when baby arrives – so prepare for that! Embrace the changes! Dan: Whoah – the sleep deprivation was quite an adjustment. Then came adjustments to nearly everything else – from the car we drove to installing baby gates! Jade: Having my husband home for the first 6 weeks. It made me feel supported and confident that I could do this! Louise: My family helped a lot. And mothers group was excellent – to meet with a group of mums with babies the same age and go through things at the same time was a lifesaver. I was so lucky to meet some of my favourite people at mothers group! Adele: Wonderful family support, a lovely Mothers group (an unexpected blessing! ), precooked meals and taking a daytime sleep when baby slept. Isla: Family members who helped with the housework! Friends with babies also gave lots of helpful, practical advice. Dan: I loved every minute of my parental leave. Getting to spend precious time at home with our baby made the bonding experience so much smoother. It’s a massive learning curve – but getting in there and helping made everything much less scary. Jade: In between the stage of ‘not being able to verbally communicate at all’ to ‘being able to communicate a little with a few words’. They became so frustrated and grumpy, and so did we! For us, this is when the tantrums started. Louise: ARGH! Teething! Interrupted sleep and a tired grumpy baby was not fun. It seemed to go on forever. She loved to chew on things and dribble everywhere! Adele: Surviving the witching hour….it’s dinner time, everyone’s exhausted and hungry and it feels like a rush against the clock to feed, bath and settle little ones before the wheels fall off! Having activities to entertain baby was an enormous help, it’s amazing what you can accomplish in 5 minutes with no distractions! Isla: Wow – the first 2 weeks at home with bub, and the non-stop feeding! It took a while to get the hang of breastfeeding so this was very challenging. So tiring and stressful. Trust yourself. The saying ‘fed is best’ worked for me. For us, a formula top up helped a lot! We were more settled and less stressed – which helped with breastfeeding. Win-win! Dan: Definitely the crying! It’s heartbreaking when your baby is upset and you’re finding it hard to soothe them. They are so tiny and defenseless and you are the people they are relying on to help them. Describe in one sentence what the first month at home with your baby was like? Jade: An incredible bonding experience that makes you feel so much joy and love. Louise: The first month at home with baby was like being hit by the most beautiful & amazing bus. Adele: Like a warm, sleepy dream. I loved it, our world was turned upside down but in the best possible way. Isla: 24/7 eating, eating, eating to breastfeed the baby, the most food I ate in my life! Dan: Totally and utterly amazing and cool and exhausting and scary and awesome – all in one tiny little bundle! What is your favourite Playgro Toy? Jade: It would have to be the Paddling Bath Fish (add link)! An old school, traditional bath toy- revamped! Keeping them entertained in the bath is golden, especially when they aren’t particularly in the mood to get in. We also got heaps of value out of the bath books and Pop and Squirt Bath Buddies (add link), we are still using ours to this day after many, many baths! Louise: I really love the play gyms. My favourite is the Jingle Jungle Musical Activity Mat (add link). To be able to safely put my baby down on the bathroom floor while I had a shower was like a million bucks! She also would lie underneath it in the lounge – hitting and kicking for ages. I also had a smaller one, like the Zoo Playtime Tummy Time Mat and Pillow (add link) I took in the car with me to Playgroup or to friends so I could lay her on the floor and she would be entertained. I also loved our Clip Clop Activity Rattle – it was great when she was teething. We could also clip it onto the pram. Adele: Without a doubt our activity gym. It was by far our most versatile toy and kept my babies entertained during floor play at home – a Godsend when I needed a few minutes! Best of all the toys were detachable so I could easily clip them to the stroller or car seat when we were out and about. The mat itself was simple to fold and take along to use at playgroup or when we were out visiting. It lasted through both my children and even a couple of nieces and nephews. I’ve even kept a couple of the most favourite hanging toys as a momento of their child hood. My favourite now is the Woodlands Music and Lights Projector Gym – it’s so cute! All I need now is a new niece of nephew so I can buy it! Isla: I like the Clip Clop Activity Rattles which we could hang on the cot or pram. Such a gorgeous design – and we have a new one now – Clopette – she’s pink and adorable and my daughter would have loved her! 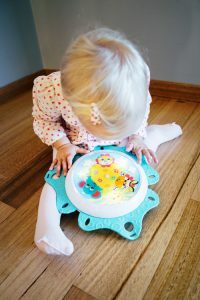 Dan: My daughter still uses the Elephant Shape Sorter – and she is three now! It’s really cute and has lots of play value. What’s the best thing about working at Playgro? Jade: Watching the toys come to life in our video shoots! It’s like being a kid again. It’s always really interesting to see how babies interact with our toys. How they help them develop their skills and the smiles they bring! Louise: Working with a great team of people to create amazing products for babies. I love the creative process and all the thought and detail that goes into every product. All items are researched and tested to meet the needs of babies and parents. I love hearing all the positive feedback on our toys! Adele: My lovely team, working together to support really wonderful Australian designed products. Products that nurture baby’s development and are trusted by parents around the world! Isla: I love seeing the flash new baby products as they launch, and the friendly people I work with! Dan: I love walking around a shopping centre and seeing Playgro toys being enjoyed by babies around the world. I still get excited when I see one!